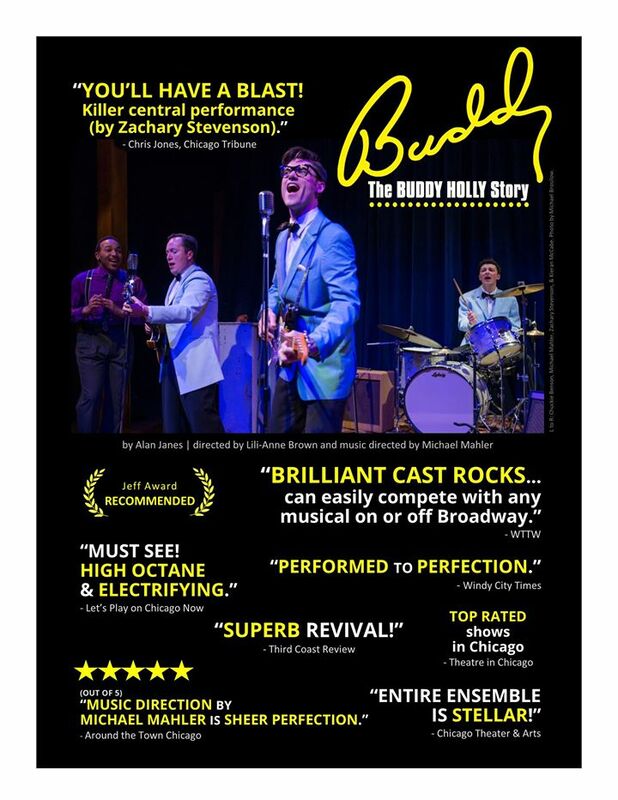 Here at ChiIL Live Shows we dig Buddy Holly and can't wait to catch American Blues Theater's acclaimed production. The encore run is selling out fast, so get your tickets while you can. 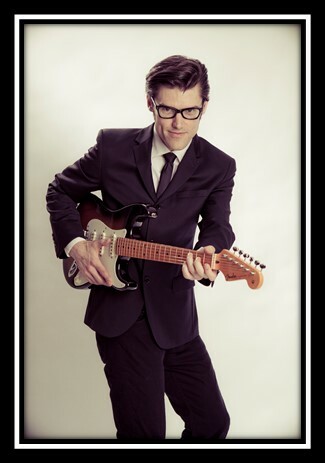 American Blues Theater announces encore performance run of BUDDY – The Buddy Holly Story, written by Alan Janes, directed by Lili-Anne Brown, with musical direction by Ensemble Member Michael Mahler. BUDDY – The Buddy Holly Story will reopen June 29 – September 15, 2018 at Stage 773, 1225 W. Belmont Ave. in Chicago. Tickets now on sale for the encore run. Before the Beatles or the Rolling Stones ever played a note, rock & roll was forever changed by the bespectacled kid from Texas. BUDDY tells the true story of Buddy Holly through his short yet spectacular career and features the classic songs "That’ll be the Day," "Peggy Sue," The Big Bopper’s "Chantilly Lace," Ritchie Valens' "La Bamba," plus many more. “American Blues Theater is thrilled to present an encore run of our production of Buddy—The Buddy Holly Story, our company’s best-selling musical to date. We’ll take a break from May 27-June 28, but the cast will be back in our intimate space at Stage 773 through September. 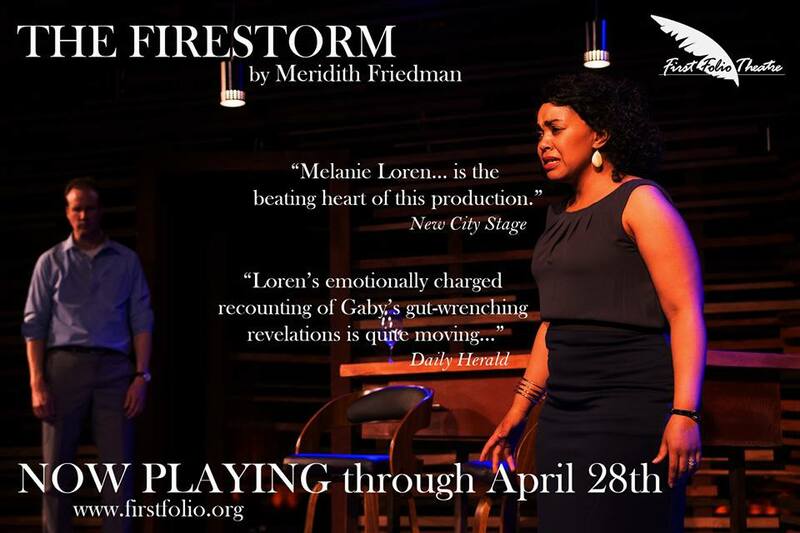 We couldn’t be happier with the outstanding reviews and audience reaction,” comments Artistic Director Gwendolyn Whiteside. Buddy Holly is an American music icon. Regarded as one of the most significant figures in the birth of rock music, he is often cited as the innovator of the traditional rock lineup of instruments – two guitars, bass, and drums. Bob Dylan, Bruce Springsteen, The Beatles, The Rolling Stones, Eric Clapton, and Elton John all name Buddy Holly as a major inspiration in their respective careers. The Encore cast of BUDDY includes Keirsten Hodgens (Apollo Performer), Chuckie Benson (Apollo Performer), Liz Chidester (Vi Petty), Ian Paul Custer* (Hi Pockets), Elisa Carlson (Company), Ann Delaney (Company), Vasily Deris (Big Bopper), Alex Goodrich (Clearlake Announcer), Derek Hasenstab (Norman Petty), Molly Hernández (Maria Elena), Cisco Lopez (Ritchie Valens), Michael Mahler* (Tommy / Cricket; music director), Kieran McCabe (Jerry / Cricket), Daniel Riley (Apollo Performer), Zachary Stevenson (Buddy Holly), and Shaun Whitley (Joe / Cricket). The creative team includes Sarah E. Ross* (scenic design), Samantha C. Jones* (costume design), Jared Gooding* (lighting design), Rick Sims* (sound design), Kevin Rolfs (properties), Malcolm Ruhl (music consultant) and John Martinez (assistant director and choreographer). The Production Stage Manager is Cara Parrish*. 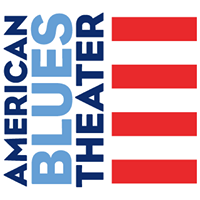 *American Blues Theater Ensemble and Artistic Affiliates. ALAN JAMES (Playwright) is an English writer and producer who has worked in TV, film, radio, and theatre. His best-known work is the musical Buddy – The Buddy Holly Story which ran for over 14 years and almost 6,000 performances in London’s West End and has been on tour in the UK for 17 years. Buddy has also played Broadway, 5 U.S. National Tours, 8 years in Germany, 3 years in Australia and New Zealand, and countless other productions around the world. Janes was nominated for an Olivier Award for Best Musical for Buddy. He also co-wrote and produced the musicals 125th Street and Jailhouse Rock, which both premiered on London’s West End. LILI-ANNE BROWN (Director) A native Chicagoan, Brown works as a director, actor and educator, both locally and regionally. She is the former Artistic Director of Bailiwick Chicago, where she directed Dessa Rose (Jeff Award), Passing Strange (BTA Award and Jeff nomination for Best Director of a Musical), See What I Wanna See (Steppenwolf Theatre Garage Rep), and the world premiere of Princess Mary Demands Your Attention by Aaron Holland. Other directing credits include The Wolf at the End of the Block (16th Street Theater); Marie Christine (BoHo Theatre); Peter and the Starcatcher (Metropolis Performing Arts); The Wiz (Kokandy Productions, BroadwayWorld Award); Xanadu (American Theater Company); Jabari Dreams of Freedom by Nambi E. Kelley (world premiere, Chicago Children’s Theatre); American Idiot (Northwestern University); the national tour of Jesus Snatched My Edges; Little Shop of Horrors, Hairspray, Unnecessary Farce, Cabaret, Sweet Charity, The 25th Annual Putnam County Spelling Bee, and Buddy - The Buddy Holly Story (Timber Lake Playhouse). She is a member of SDC, AEA, SAG-AFTRA, and a graduate of Northwestern University. MICHAEL MAHLER (Tommy / Cricket; Music Director) is an Ensemble member of American Blues Theater. His Blues appearances include It’s a Wonderful Life: Live in Chicago!, “Seymour” in Little Shop of Horrors, “Clifford” in Side Man, and “Jimmy” in Hank Williams: Lost Highway. Other Chicagoland credits include Honeymoon in Vegas (Marriott Theatre); The March (Steppenwolf Theatre); Working (Broadway Playhouse); The Illusion (Court Theatre); The Fox on the Fairway, Dirty Rotten Scoundrels (Jeff nomination), and The Producers (Theatre at the Center). Recent music directing credits include Parade (Writers Theatre) and Road Show (Chicago Shakespeare Theater, Jeff nomination). Michael is a composer/lyricist who contributed additional lyrics to the new Broadway production of Miss Saigon. Other works include Diary of a Wimpy Kid, The Man who Murdered Sherlock Holmes (Jeff Award), October Sky (San Diego Theatre Critics Circle Award), and Hero (Jeff Award). CHUCKIE BENSON (Apollo Performer) recently originated “Truman Hayes” in the world premiere musical, TRU, at the Chicago Music Theatre Festival. He received a Jeff nomination for his performance as the “Lion” in Kokandy’s production of The Wiz. Chuckie was also a part of the Chicago cast of Spamilton. He has played some of his favorite roles at Wagon Wheel Center of the Arts including “Coalhouse Walker Jr.” in Ragtime, “Curtis” in Sister Act, and “Teen Angel” in Grease! Regional credits include: Hair (Mercury Theater Chicago), “Tom Collins” in Rent (Theo Ubique), Woman of the Year (Porchlight Music Theatre), and “Jim” in Big River (Timber Lake Playhouse). Chuckie received his BFA in Music Theatre Performance from Western Michigan University, and is a native to Lansing, MI. LIZ CHIDESTER (Vi Petty) is a singer/songwriter, actor, and teaching artist from Virginia. Her Chicago theatre credits include: Lizzie (Firebrand Theatre), High Fidelity (Refuge Theatre Project, Jeff Award - Best Musical), Billy the Kid (Cabinet of Curiosity Events), Big River and Pump Boys and the Dinettes (Theatre at the Center), Ring of Fire (Mercury Theater Chicago), and Stupid F**ing Bird (Sideshow Theatre Company). Her original albums with her band LIZ AND THE LOVELIES include Progress into Simplicity (2017 - Best Roots EP, Independent Music Awards 2018), Otter Hill (2015), and People Pumping Pedals (2014). She teaches group and private lessons at Old Town School of Folk Music. IAN PAUL CUSTER (Hi Pockets) is an Ensemble member at American Blues Theater. Recent American Blues credits: “David Halberstam” in The Columnist (Jeff nomination - Best Production, Midsize), It’s A Wonderful Life: Live in Chicago! (Jeff nominations - Best Ensemble and Best Production, Midsize), “Orin Skrivello” in Little Shop of Horrors (Jeff nomination - Best Production of a Musical, Midsize), and “Adam” in Yankee Tavern. Recent Chicago credits: Bad Jews (Theater Wit, North Shore Center, Royal George), 33 Variations (TimeLine Theatre, Jeff Award - Best Production, Midsize), Annie Bosh is Missing (Steppenwolf Theatre), High Holidays (Goodman Theatre), To Master the Art (Broadway Playhouse/TimeLine Theatre), Strangers, Babies (Steep Theatre), and Fiddler on the Roof (Paramount Theatre). Regional credits: Hero: The Musical (Asolo Rep Theatre), Cymbeline (Notre Dame Shakespeare), Romeo and Juliet (Cardinal Stage), and Peter Pan (360 Entertainment - London, England). Television credits: APB, Empire, Chicago Fire, and Chicago PD. ELISA CARLSON (Company) She holds a bachelor’s degree in piano performance and theater from Indiana University. She is a company member of Innervation Dance Cooperative, an ensemble member of Barrel of Monkeys, and a singer and multi-instrumentalist at Howl at the Moon Chicago, entertaining audiences nightly on the piano, violin, drums, and bass. ANN DELANEY (Company) is making her American Blues Theater debut. Her recent Chicago theatre credits include Hatfield and McCoy (The House Theatre of Chicago); It’s a Wonderful Life, Cabaret, Nice Work If You Can Get It, Spamalot, and Big Fish (Theatre At The Center); All Our Tragic and Gilbert and Sullivan Rep (The Hypocrites); Hobo King (Congo Square Theatre); and Mr. Burns (Theater Wit). VASILY DERIS (Big Bopper) Chicago credits: the Jeff Award-winning Smokey Joe's Café (Theo Ubique), “Barry” in the Jeff Award-winning High Fidelity (Refuge Theatre Project), “Eric” in Creatives (Chicago Theatre Workshop), “Shawn Eckhardt” in Tonya and Nancy: The Rock Opera (Underscore Theatre), and “Pharaoh” in Joseph (Paramount Theatre). ALEX GOODRICH (Clearlake Announcer) makes his American Blues Theater debut. Credits include Hero: The Musical (Jeff Award - Best Supporting Actor in a Musical); Honeymoon in Vegas; She Loves Me; How To Succeed in Business..; Elf the Musical; On The Town; I Love You, You’re Perfect, Now Change; and For The Boys (Marriott Theatre); The Importance of Being Earnest (Writers Theatre); Love's Labor’s Lost; The Emperor’s New Clothes; A Midsummer Night’s Dream; Seussical; Taming of the Shrew; Aladdin; and How Can You Run... (Chicago Shakespeare Theater); Miss Bennet; Shining Lives; Civil War Christmas; and She Stoops to Conquer (Northlight Theatre); Old Jews Telling Jokes (Royal George); The Comedy of Errors and One Man Two Guvnors (Court Theatre); Everything Is Illuminated (Next Theatre); A Midsummer Night’s Dream (Indiana Repertory); and Goodnight Moon and Harold and the Purple Crayon (Chicago Children’s Theatre). KEIRSTEN HODGENS (Apollo Performer) Most recent credits include: Ragtime (Marriott Theatre), The Naked Truth (reading, West End Lounge), Spamilton (Royal George), Jesus Christ Superstar (Paramount Theatre), and Smokey Joe’s Café (Drury Lane Oakbrook). She would like to thank her friends, family, extraordinary girlfriend, her team at Stewart Talent. DEREK HASENSTAB (Norman Petty) makes his American Blues Theater debut. 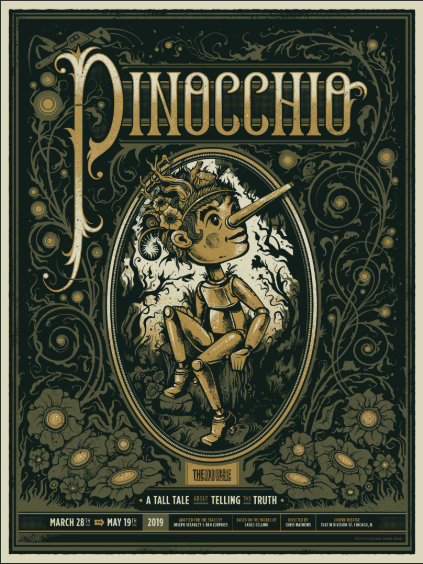 Chicago theatre credits include shows with Lookingglass Theatre Company, Goodman Theatre, Steppenwolf Theatre, Writers Theatre, Chicago Shakespeare Theater, About Face Theatre, Victory Gardens Theater, Court Theatre, Marriott Theatre, and Drury Lane Oakbrook, among others. Regional credits include: “Doc” in Come Back, Little Sheba (IRNE and Elliot Norton Nominations, Huntington Theatre Company), “Hermes” in Metamorphoses (Arena Stage, Mark Taper Forum), and “Tom” in The Glass Menagerie (Kansas City Repertory Theatre). National Tour: “Zazu” in The Lion King. MOLLY HERNÁNDEZ (Maria Elena) makes her debut at American Blues Theater. Favorite credits include “Rosabella” in The Most Happy Fella (Theo Ubique); “Julie Jordan” in Carousel, Mary Poppins, Evita, and Scapino (Timber Lake Playhouse); Crime Scene: Breath Life and Forgotten Future: Education Project (Collaboraction). Last year she was given the Award of Excellence in Professional Theatre from the Illinois Theatre Association and was nominated for a Jeff Award for Best Actress in a Musical for her work in The Most Happy Fella. Molly can be seen on Chicago PD ep. 105 as “Elisa Rodríguez” and APB ep. 105 as “Maya Ruiz”. CISCO LOPEZ (Ritchie Valens) makes his American Blues Theater debut. Chicago credits include Merrily We Roll Along, Woman of the Year, New Faces Sing Broadway 2001, and In the Heights (Porchlight Music Theatre); Bonnie & Clyde (Kokandy Productions); In To America and Letters Home (Griffin Theatre); Planted (Rogue Elephant Productions); Dead Man Walking (Piven Theatre); Mutt (Stage Left and Red Tape Theatre); Macbeth (Midsommer Flight); Take Me Out (Eclectic Theatre); and Fiddler on the Roof and Damn Yankees (Light Opera Works). Film credits: Boystown and Closet Memories. He holds a BFA in Theatre Performance from Baylor University and is represented by Shirley Hamilton. KIERAN MCCABE (Jerry / Cricket) This Philadelphia native is making his American Blues Theater debut. Kieran’s favorite credits include “Fluke Holland” in Million Dollar Quartet, “Scapino” in Scapino, “Orin Scrivello” in Little Shop of Horrors, “Agustin Migaldi” in Evita, “Mr. Manningham” in Gaslight, “Stacee Jaxx” in Rock of Ages, Carousel, Mary Poppins, Titanic, and A Funny Thing Happened on the Way to the Forum (Timber Lake Playhouse), and “Freak” in columbinus (Loyola Chicago). Kieran drums and writes for the Indie Rock trio Day Off (@dayofftheband). Kieran puts his English Creative Writing degree to good use as a Head Writer for Kettle Camp Studios, a Chicago based production company. DANIEL RILEY (Apollo Performer) is a Chicago-based performer who studied at Harold Washington College and Roosevelt University. 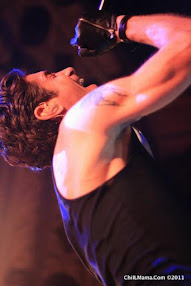 He has worked in theatre and cabaret with numerous groups in and around Chicago, most recently Paramount Theatre, Davenport’s Piano Bar, The Inconvenience, and the Ravinia Festival. Dan also coaches and accompanies soloists and choirs of all ages in many styles of music. He regularly sings with Holy Name Cathedral and the Lakeside Singers, and can be seen Sunday mornings on WGN-TV singing for Mercy Home for Boys and Girls. Dan is also featured (along with Michael Mahler) on Dark Side of the Moon A Cappella (VOCOMOTION Productions). ZACHARY STEVENSON (Buddy Holly) makes his American Blues Theater debut. Originally from Vancouver Island, Canada, Zach recently relocated to Chicago after spending the last few years being based in Kansas City, MO. Select credits include: Million Dollar Quartet (Paramount Theatre – “Carl” U/S), Hair (CanStage), Ring of Fire (Chemainus Theatre Festival / Western Canada Theatre), Hank Williams: The Show He Never Gave (Blue Bridge Repertory), Urinetown (Belfry Theatre), Red Rock Diner (Arts Club Theatre), Assassins (Quintessence), and more than ten productions of Buddy - The Buddy Holly Story throughout the US and Canada, for which he’s been nominated for a Jessie Richardson Award and Ovation Award. Zachary has also had the pleasure of music directing several productions, including Million Dollar Quartet (Arts Club), and Ring of Fire (Chemainus Theatre Festival), as well as performing in countless headlining concerts across North America. Off stage, Zach is busy writing a one-man show about the 1960s folksinger and activist, Phil Ochs. SHAUN WHITLEY (Joe / Cricket) returns to American Blues Theater. He is a multi-instrumentalist, actor, composer, and Jeff-nominated music director. He performed nearly 1800 times as “Carl Perkins” in the longest running Broadway musical in Chicago history, Million Dollar Quartet. Other Chicago credits include: Chicago Shakespeare Theater, Drury Lane Oakbrook, The Second City, Remy Bumppo Theatre Company, Strawdog Theatre, TUTA, Redmoon Theater, Blindfaith Theatre, and Provision Theater. He studied Shakespeare at RADA in London. He teaches at the Old Town School of Folk Music. For this production, American Blues Theater will offer complimentary tickets to students of Chicago Public Schools and Guitars Over Guns. In addition, artists will visit assisted-living facilities to give mini-concerts. American Blues also continues its “Pink Previews” to donate proceeds from all preview performances to The Lynn Sage Foundation for breast cancer research. The diverse and multi-generational artists have established the second-oldest professional Equity Ensemble theater in Chicago. The 34-member Ensemble has 600+ combined years of collaboration on stage. As of 2018, the theater and artists received 195 Joseph Jefferson Awards and nominations that celebrate excellence in Chicago theater and over 35 Black Theatre Alliance Awards. The artists are honored with Pulitzer Prize nominations, Academy Awards, Golden Globe Awards, Emmy Awards and numerous other accolades.